A tractor-trailer has overturned on a Polish highway, spilling tons of liquid chocolate that are solidifying into a huge sticky mess. 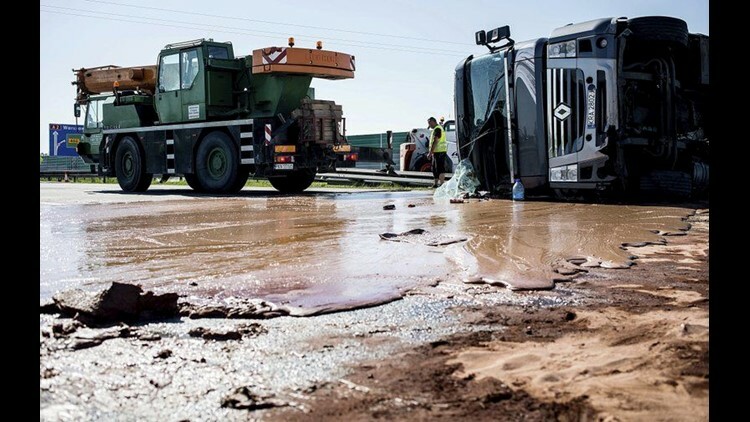 Tons of liquid milk chocolate are spilled and block six lanes on a highway after a truck transporting it overturned near Slupca, in western Poland, on Wednesday, May 9, 2018. WARSAW, Poland (AP) — A tractor-trailer has overturned on a Polish highway, spilling tons of liquid chocolate that are solidifying into a huge sticky mess.